In the third instalment of CoBo’s series on Cambodian photographers, Naima Morelli talks with artist Sophal Neak, a rising talent in the Cambodian scene. With her essential and sharp visual vocabulary, Sophal Neak’s art of photography is both surreal and direct. 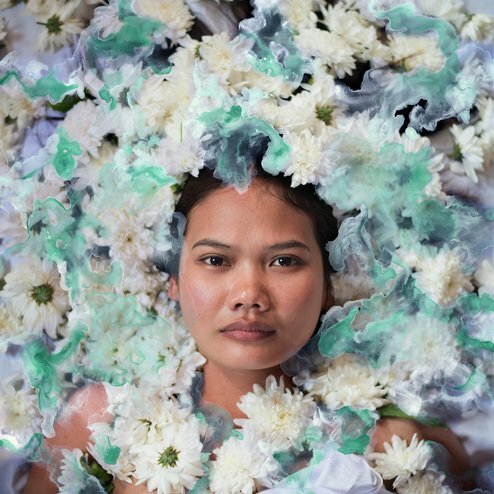 The artist applies her style to a variety of issues that are not only specific to Cambodian culture, but also shared by everyone. The artist has the soul of a storyteller, a gift that reveals itself through the medium of photography. Indeed, she builds her conceptual photographs in an almost performative way, engaging in dialogues with her models, who she asks to pose with specific objects. These simulacra correspond not only to the concept of the series, but are also form an integral part of the model’s life. She decided to take a gap year during which time she studied a little English and learned some computer skills. “One day my brother brought me to the design school and dropped me off there. He said it was the final place for me to find out what I would like to study, and they would give up on me if I did not,” she laughed. She ended up going for it, as it meant she would get closer to her creative side. Your interest in photography came from a few seminal workshops. Can you describe what it was that convinced you this was going to be your primary medium of expression? Actually, the first workshop I participated was in Photo Phnom Penh. The first course was six months and prepared by the French Institute in Cambodia. It was there that I learned the foundations of photography. It was the first time I’d heard that a picture could tell a story; this was a big discovery for me at the time. While I had always loved drawing and painting, I didn’t consider myself to be very good at it, so I chose photography because it was technically easier for me; you just need one click. Then I joined some other workshops that were really important to me, including at the Angkor Photo Festival, which taught me how to find myself artistically. Was the storytelling element of photography present from the very beginning of your art practice? Actually, I started off doing documentary photography because it was to learn general photography skills, such as composition, lighting, and so on. Over time, however, I realized I wasn’t drawn to this because there were plenty of documentary photographers tackling similar subjects and I didn’t feel that my work added to it in a meaningful way. So, after more research and the experience of the Angkor Photo Festival, I decided to go my own way, which is more conceptual. I noticed that I previously used to adapt the concept to my style, but these days I’m increasingly adapting my style to the concept. Much of your work represents issues that are often not openly spoken about. One is the woman’s role in Cambodia’s patriarchal society, which you analysed in two different series: ‘Flower’ and ‘Rice Pot’. Can you tell me about the different approaches you used to tackle this theme? For me, the two series looked at the same topic from different angles. Here in Cambodia, we have a male-dominated culture that oppresses women; it is difficult for us to reach our dreams or goals, and as a woman, I feel compelled to talk about this problem. I believe that if women won’t become vocal about our problems, no one will talk about it. In the end, it’s not even about women and men, it’s about us being all humans. When I create an artwork, I generally think about the concept first and I’m not really concerned with the public’s reaction. If you think about the “Rice Pot” series, it doesn’t try to be aesthetically pleasing. Conversely, in ‘Flower’ I did something different. The style was a bit more fashionable, but it was done intentionally. The stains and the white clothes that are present in the photographs were a reference to the Khmer comparing women to white paper and men to gold. If gold is dropped in the mud, it can be polished and cleaned, the saying goes, whereas white paper is permanently stained, and once it’s considered dirty, no longer has any value. This proverb expresses a double-standard, which is present in Cambodian society. In the photographic series, the medium follows the concept. The ‘Rice Pot’ series is more straightforward and talks about women and their work in the kitchen. In order to realize it, I went to a village and interviewed a number of women, explaining my concept to them. The fact that we get an agreement on the concept is the most important thing. For ‘Rice Pot’, I photographed the women in natural light. The rice pots are blackened and the focus isn’t beautiful per se. Once again, the final look of the work just naturally followed the concept. I noticed that the identity of the subject is hidden in most of your pictures. In ‘Leaf’, the subjects have a leaf hiding their faces, and in ‘Behind’, they are turned against the wall. Why is that? This idea came to me accidentally while I was working on ‘Rice Pot’. One woman I talked to before starting the shoot, told me that cooking was the biggest obstacle in her life as it hindered her by stopping her from studying, going out and having fun. She cooks three times a day, so it’s very heavy work for her. 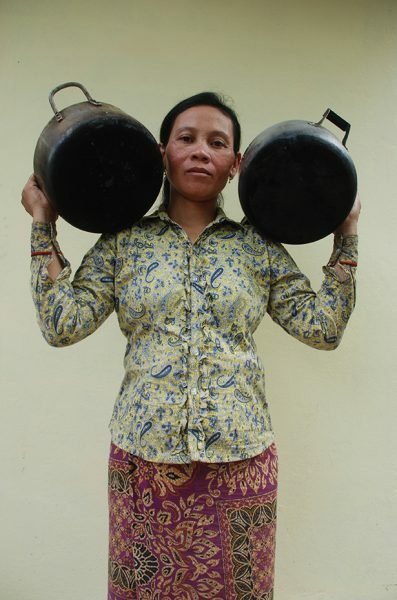 I asked her to hide her face behind the pot to symbolise how the household chores are erasing her identity. That image stuck with me and I kept on repeating it in the other series. Another story of this kind happened during the shooting of ‘Behind’. All the people photographed in the series are facing the wall. The initial idea was to simply take pictures of people walking in the street and the street vendors, who are not allowed to sell or work on the sidewalk. Even if they are continually sent away, they keep on coming back because they have no choice. I asked them for their picture, but they were suspicious. We came to an agreement that I would only take photos of them from behind, facing a wall. For me, this series relates to Cambodia’s cultural habit of not saying things to your face, keeping quiet, and complaining only in private. 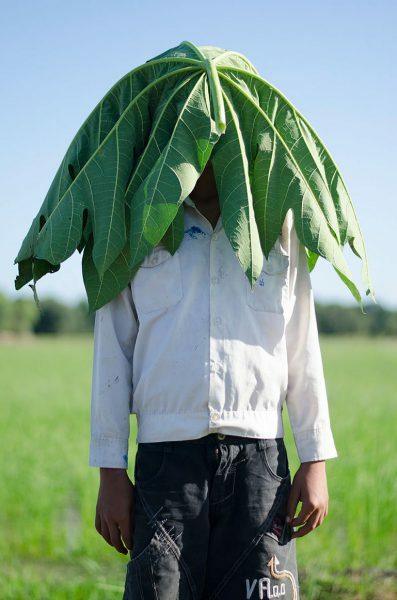 Perhaps this is a legacy of the Khmer Rouge when people needed to hide their identity. Speaking of the dark past of Cambodia, the theme of memory is very much present in your work, including a series like “Thread” or “Wild spirit”. Can you explain a little about how the theme of memory relates to your generation of artists who didn’t experience the trauma of the Khmer Rouge first-hand? For me, the memory is something that’s hidden. You don’t know what happened with the Khmer Rouge if someone doesn’t talk about it. For example, not all parents speak to their children about what happened, and the most horrible stories are never told because they are way too hard to talk about, too painful. It was a very dark period in our history, but I believe that if we want to move on and not return to the same kind of regime, we need to know how to escape from it. Many artists from my generation confront these events, in one way or another. I feel it is very important for both my generation and the younger generation to learn more about the Khmer Rouge. We don’t need to read and do research somewhere, we just have to ask our parents. Our parents lived through it, so why not ask them? Books are not always reliable, but you can trust the direct experience of your parents, who won’t lie to you. It’s important to preserve these stories for the younger generation, who otherwise won’t believe it happened. Neak Sophal (b. 1989, Cambodia), graduated from the Royal University of Fine Arts, Phnom Penh. 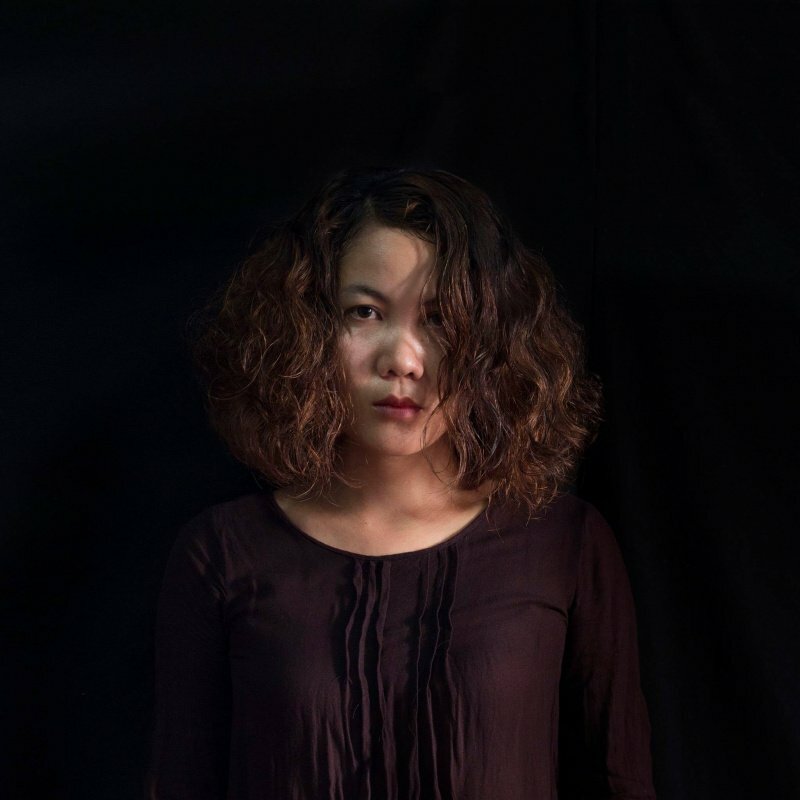 She has been actively involved in workshops and group exhibitions both locally and internationally over the last three years, including the Angkor Photo Festival (Siem Reap, 2014), Spot Art (Singapore, 2014), Hong Kong International Photo Festival (Hong Kong, 2014), Asian Eye Culture (Thailand, 2014), Jong Jam (Bophana, 2014), KepExpo (2013), Angkor Photo Festival (where she won the first prize in the workshop, 2013), Voice of Tacitness Exhibition (China, 2013), Our City Festival (2012), SurVivArt (Meinblau, Berlin, 2012), PhotoPhnomPenh (2010, 2012), Big Eyes (Sa Art Gallery, 2011) and Hey Sister, Where Are You Going? (Sovanna Shopping Mall, 2010).